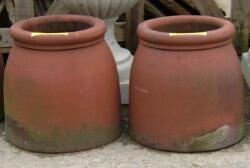 IF YOU ARE TRYING TO MATCH YOUR OWN POTS PLEASE SEND PHOTOS/PICTURES AND WE'LL SEE WHAT WE HAVE IN STOCK. 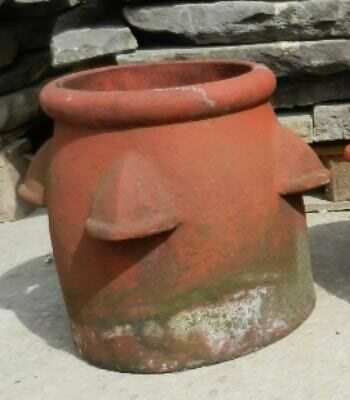 A small terracotta chimney pot. 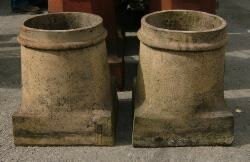 Two reclaimed, glazed, plain square, chimney pots. A plain dark, round chimney pot. 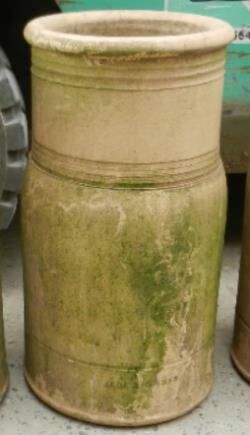 406mm (16") diameter external size. 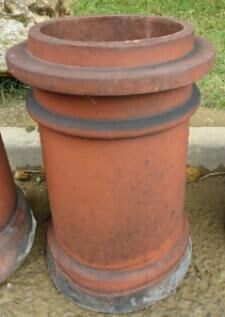 A reclaimed, dark bulbous topped, plain chimney pot. A dumpy , plain dark, round chimney pot. 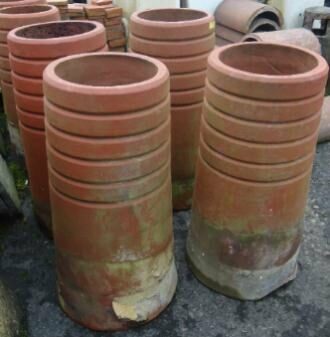 A set of 6 no.small plain, terracotta chimney pots. To see all 6 pots look in the "enlarged image" heading. 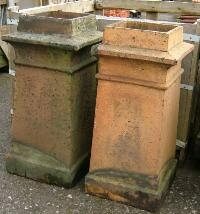 A pair of reclaimed, dark orange terracotta chimney pots, with ornate tops. 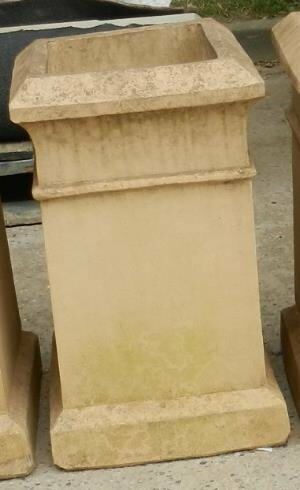 A set of 10no.small plain, buff chimney pots. To see all 10 pots look in the "enlarged image" heading. 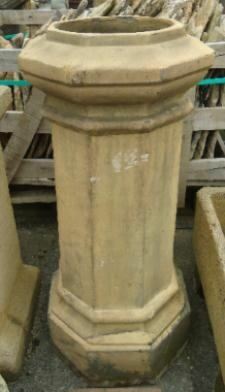 A set of 5no, buff square, chimney pots. To see all 5 pots look in the "enlarged image" heading. 330mm (13") square external size. 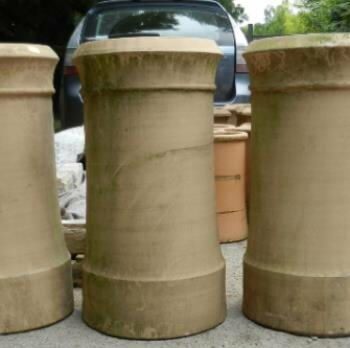 A set of 4no.small, buff chimney pots. To see all 4 pots look in the "enlarged image" heading. 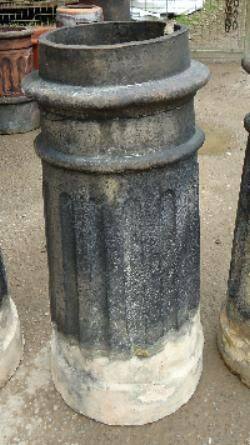 A set of 5no, large buff, chimney pots. 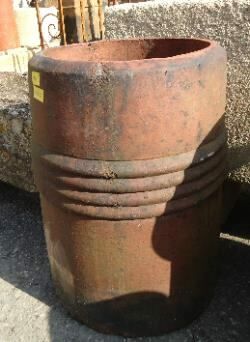 A reclaimed, terracotta tapered chimney pot. 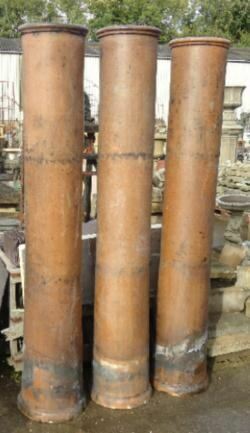 Three reclaimed, terracotta tapered, chimney pots. 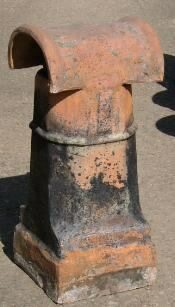 A reclaimed, tall crown vented, two part, chimney pot. 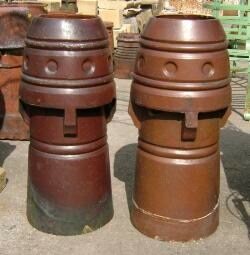 Two reclaimed, light buff, tall chimney pots. 305mm (12") external diameter size. 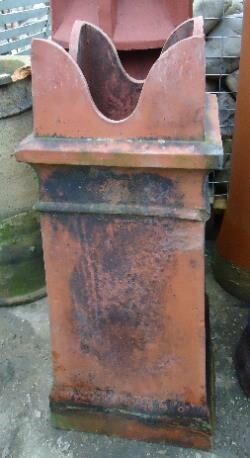 A reclaimed, terracotta chimney pot, with side vents. There are 2no. of these just in, look at "enlarged image" heading to see the pair. Turned up, the other way, ideal strawberry pot. 305mm (12") diameter external size. 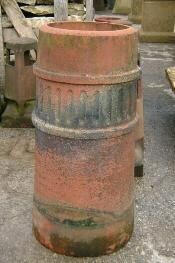 A reclaimed, tall glazed, unusual chimney pot. 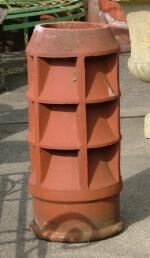 A reclaimed, red terracotta chimney pot, with side vents. these just in, look at "enlarged image" heading to see all 4 . 355mm (14") diameter external size. 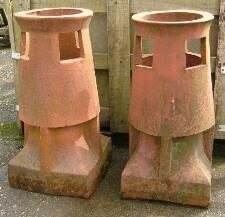 A pair of reclaimed, terracotta small chimney pots. 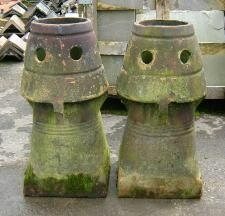 We have just taken in a new batch of chimney pots and this is a pair of 14no. Please looked at the "enlarged image" heading to see all 14 no. we have in stock at the moment. 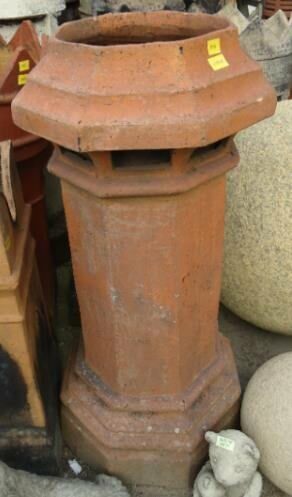 A reclaimed, red terracotta hexagonal chimney pot, with flat top . Would make a nice table base, or could be used as a seat. mm ") diameter external size. 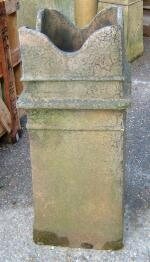 A reclaimed, light buff chimney pot, . 267mm (101/2") diameter external size. A tapered red chimney with decorative pattern. 600mm (23 1/2 ") high. 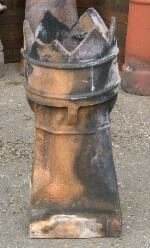 A reclaimed , 4 pointed, glazed chimney pot. 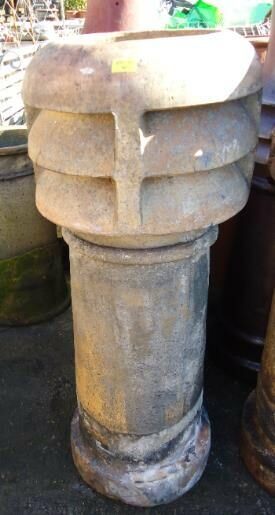 A reclaimed, 4 pointed , glazed chimney pot, . 318mm (121/2") x 330mm (13") external size. 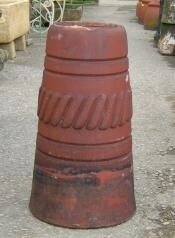 A reclaimed red, canon style chimney pot. 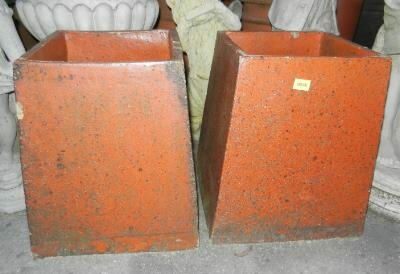 A reclaimed red/terracotta square chimney pot, with a 4 pointed top. A reclaimed, light buff chimney pot, with a vented top. 330mm (13") diameter external size. A reclaimed light buff chimney pot, with a vented top. 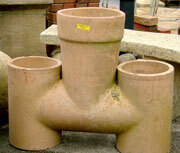 A reclaimed, terracotta chimney pot, with holed vents. 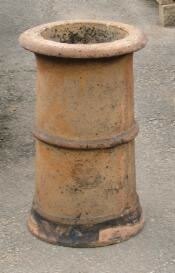 A reclaimed brown glazed, 6 pointed crown chimney pot with vents. 380mm (15") x 355mm (14") external size. 380mm (15") x x 335mm (14") external size. 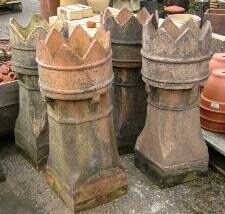 A reclaimed champion, crown chimney pot. 330mm(13") x 280mm (11") external size. 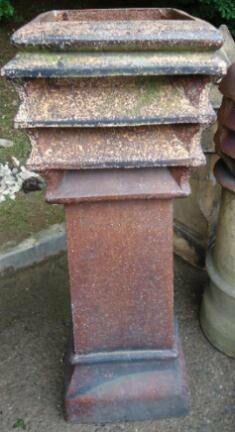 A reclaimed, light terrracotta/buff chimney pot. 355mm (14") external diameter size. 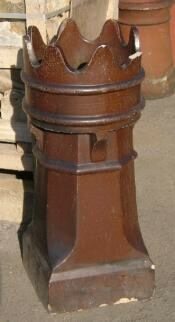 A reclaimed Canon, light buff chimney pot. 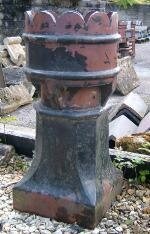 A reclaimed, buff chimney pot. 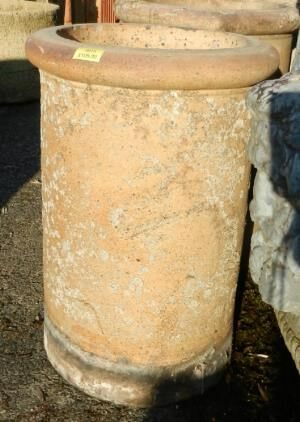 A reclaimed light terracotta chimney pot, with single ring near the top. 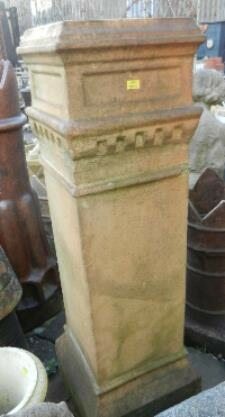 A reclaimed, light buff chimney pot. 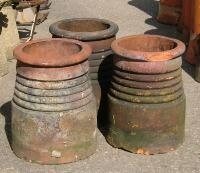 A reclaimed, terracotta chimney pot, with rings. 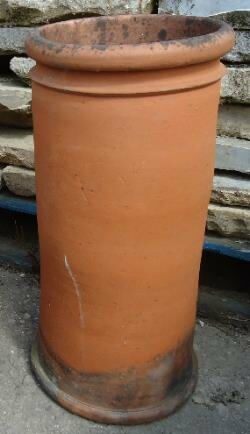 A reclaimed terracotta chimney pot. 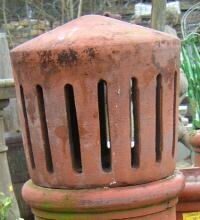 A reclaimed, terracotta, hexagonal, vented chimney pot. 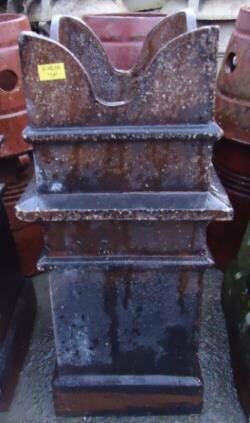 A reclaimed, glazed champion chimney pot,. A reclaimed, buff chimney pot, with louvred top. 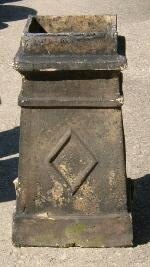 A reclaimed chimney pot, with a raised diamond pattern on the sides. 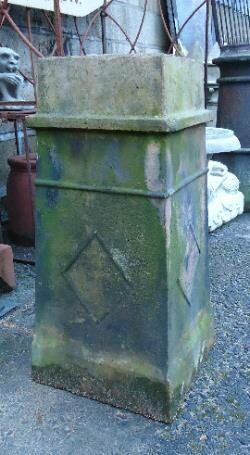 A reclaimed, chimney pot, with a raised diamond shapes on the sides. 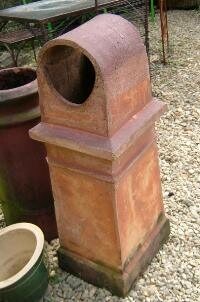 A reclaimed, very unusual terracotta chimney pot. 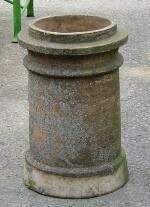 A reclaimed round,terracotta chimney pot, with a raised ring at the top. 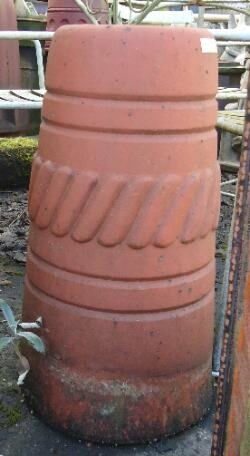 A reclaimed, round terracotta chimney pot, with 3 raised ringed pattern. 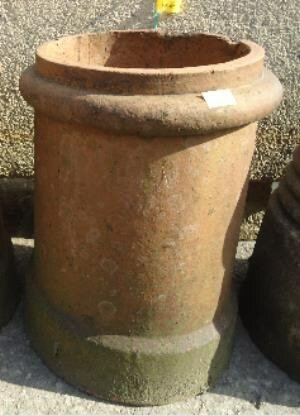 A reclaimed round, small terracotta chimney pot, with a raised ring near the top. 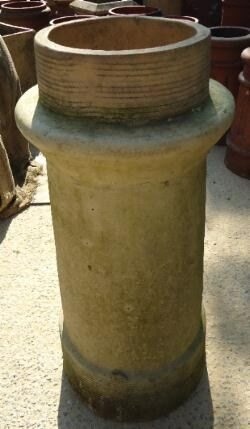 A reclaimed light buff, round chimney pot. 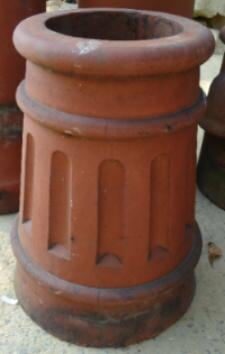 A reclaimed, small red, canon style chimney pot. 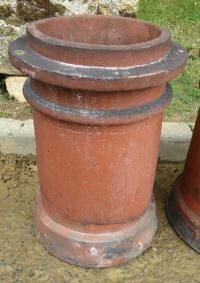 A reclaimed, small red, canon style, chimney pot. 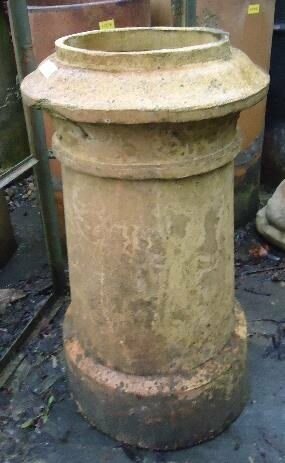 A reclaimed,buff round chimney pot, with a crown, louvred top section. 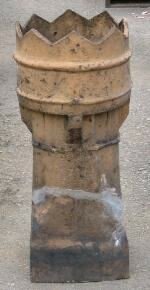 A reclaimed buff, crown chimney pot, with a crown louvred top section. 330mm (13") x 362mm (14 1/4") external size. 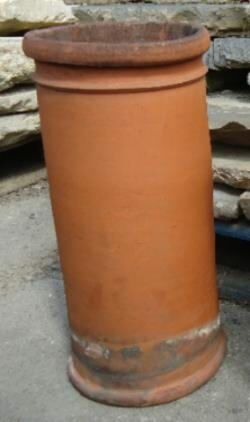 A reclaimed red terracotta chimney pot. 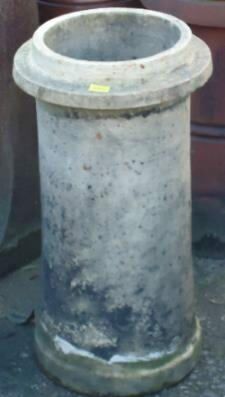 A reclaimed chimney pot with indents in the sides. (We have 3 no. of these in strock at the moment, please look at the "detailed image" to see all 3 together). 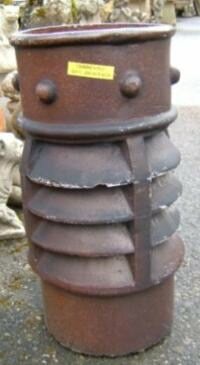 A reclaimed brown glazed, crown chimney pot with vents. 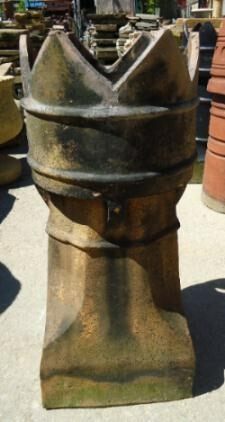 A reclaimed glazed, dark brown, round chimney pot. 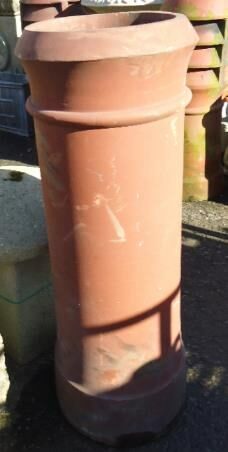 A reclaimed light coloured terracotta, tall chimney pot. 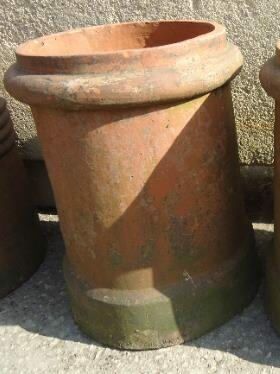 A reclaimed tall, red terracotta chimney pot. 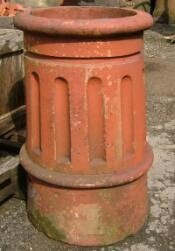 A reclaimed unusual shaped,red terracotta, tall chimney pot. 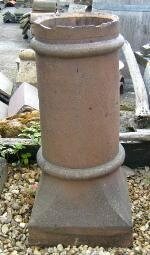 A reclaimed, brown glazed, tall chimney pot, with a square base. 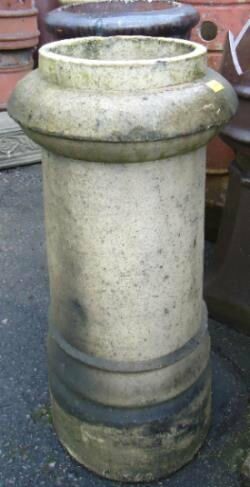 A reclaimed buff colour, 6 pointed crown top, chimney pot. 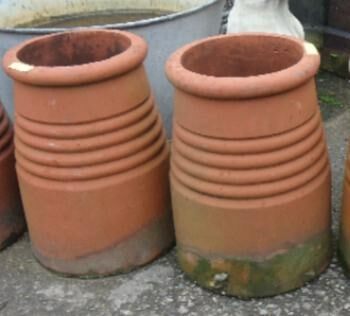 (This pot has a piece broken on the base, but, if it was used as a chimney replacement, this would be bedded in with cement.) Damage is shown on the "detailed image" if you wish to see. 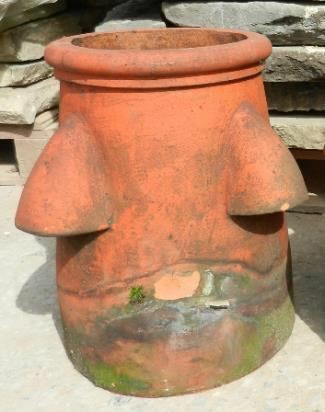 A reclaimed, red terracotta chimney pot, with indented spots. At the moment we have 3 no. of these in stock. 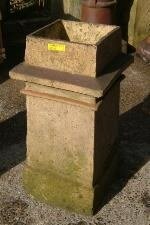 A reclaimed light terracotta, 6 pointed (points have a flat edge) crown top, chimney pot. 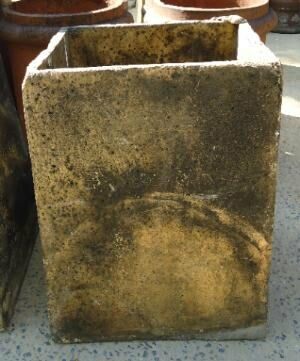 A reclaimed, buffed top chimney pot with 8 points..
279mm (11") x 305mm (12") external size. 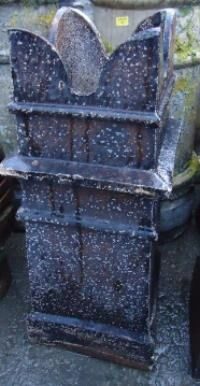 A reclaimed buff top chimney pot. We have several similar in stock, please let us know if you need to order move than one, so we can arrange delivery for you. 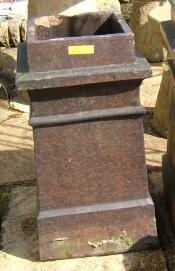 A reclaimed square buff finished chimney pot. We have 4 similar in stock, please let us know if you need to order move than one, so we can arrange delivery for you. 305mm (12 1/2") square external size. 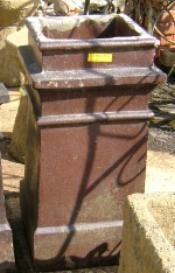 A reclaimed, square buff finished chimney pot. We have 4 similar in stock. 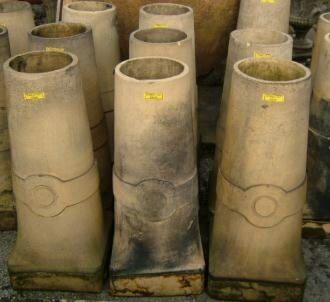 A selection of reclaimed, medium sized terracotta chimney pots, with a ringed pattern. We have 6 no. of this style in stock at the moment. 2 of them are slightly more tapered at the top. 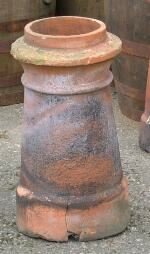 A reclaimed, round terracotta chimney pot, with a ringed pattern. At the moment we have 5 no. in stock. Please see detailed image to see all 5. 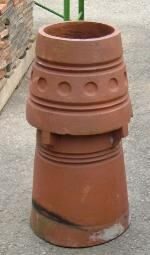 A reclaimed brown glazed, unusual spiral vented chimney pot. 3 no. 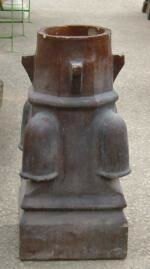 Long Tomms, reclaimed, chimney pots. 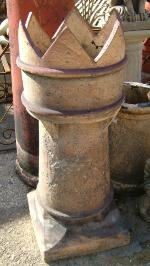 A reclaimed, round painted terracotta chimney pot. 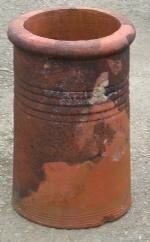 A reclaimed buff, ring pattern chimney pot. 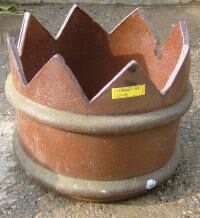 A reclaimed, 6 pointed crown chimney pot. 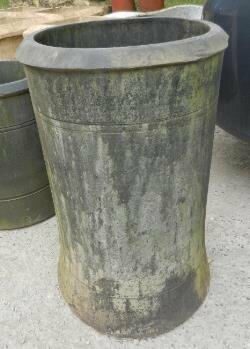 A reclaimed buff, crown chimney pot. 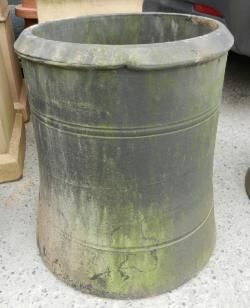 A reclaimed, buff square chimney pot, with 4 points. 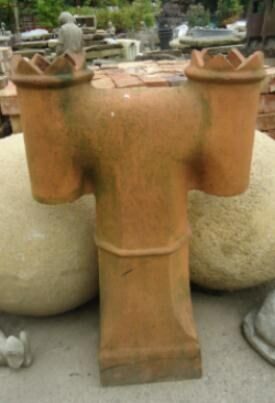 A reclaimed, red terracotta curved 2 opening vented cowl. 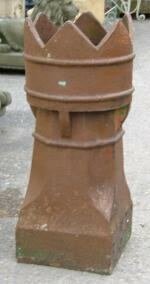 Will fit into a 203mm ( 8") diameter internal measurement chimney pot. 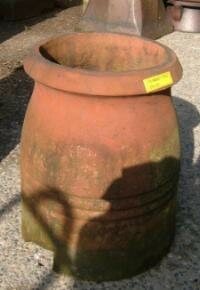 A reclaimed, red terracotta round chimney pot. With rim on top and bottom. A reclaimed, red terracotta round cowl. With unright air vets. 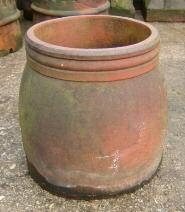 A reclaimed, red terracotta round chimney pot. With rim top and bottom. 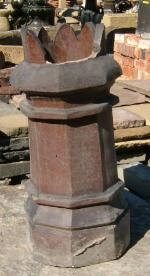 A red terracotta, louvred top, reclaimed chimney pot. 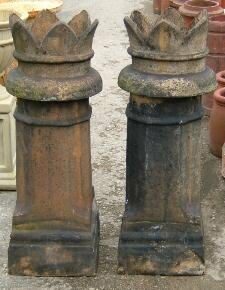 A few of a batch of approximately 25 plus, reclaimed buff chimney pots. 310mm (12 1/4 ") square . 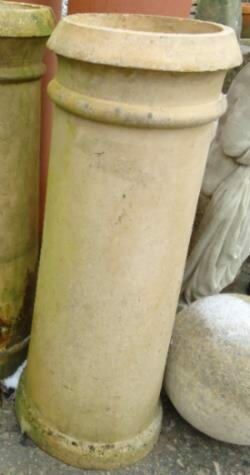 A light coloured, crown reclaimed chimney pot. Has a small hole in the side of the pot. 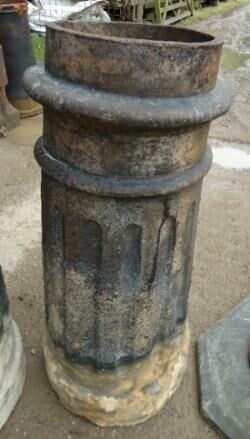 A glazed reclaimed chimney pot. 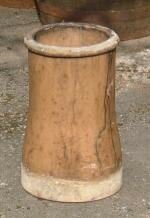 A handmade reclaimed chimney pot. 800mm (31 1/2 ") high. 368mm (14 1/2 ") diameter external. A glazed, louvred chimney pot with a raised spotted pattern. 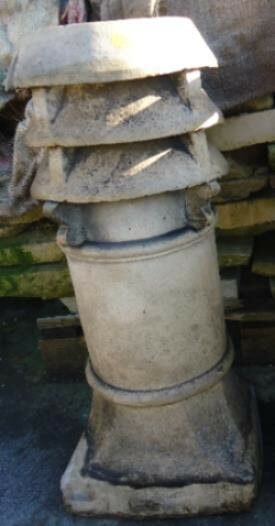 A tapered chimney pots with a raised slanted pattern. Base : 355mm ( 14") diameter. 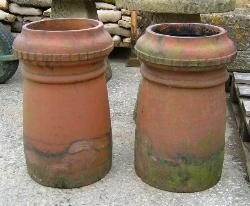 2 small red chimney pots . Size : 450mm (17 3/4") high. Base : 330mm (11") diameter. 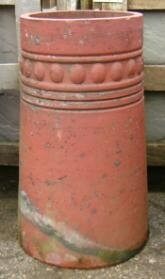 A small red chimney pot with a ring pattern. A buff tall crown and louvred chimney pot. One point of the crown is damaged. 1060mm (45 1/2 ") high. 300mm (11 3/4 ") square. A tall buff crown and louvred chimney pot. 1160mm (45 3/4 ") high. 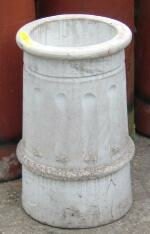 A white painted red chimney pot, with fluted pattern. A black painted crown cimney pot. 980mm (38 1/2 ") high. A buff chimney pot with some damage to crown . 775mm (30 1/2 ") high. 290mm (11 1/2 ") square . A brown louvred chimney pot. 1000mm (39 1/4 ") high. 320mm (12 1/2 ") square external. 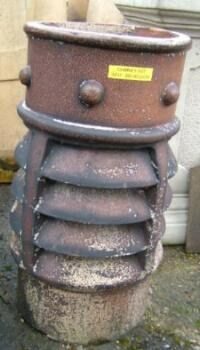 A dark brown chimney pot with some damage to crown . A buff chimney pot, vented holes. 295mm (111/2 ") square external. 5 no. 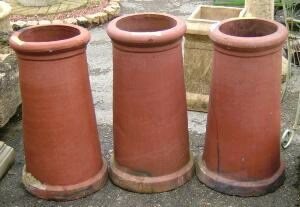 small red plain round chimney pots. 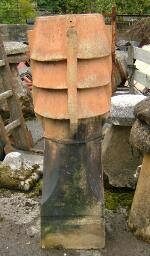 A unusual shaped buff chimney pot . 2 no. 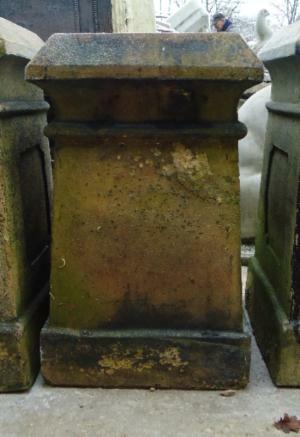 round chimney pots, with indented spots. These have been painted red at some time. 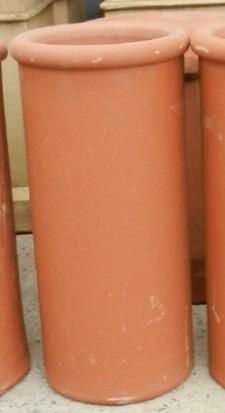 310mm (121/4 ") external diameter..
4 no. 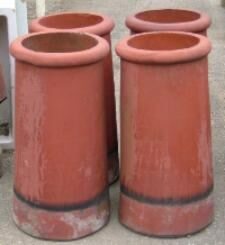 small red plain round chimney pots. £ SOLD each including VAT. 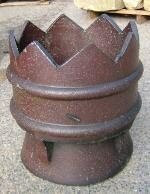 A buff crown chimney pot, with small crown points. A tall buff crown chimney pot with some damage to a rim, near the crown. 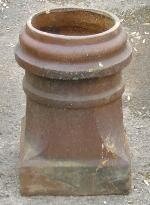 A buff round chimney pot with centre ring pattern..
A buff crown chimney pot. 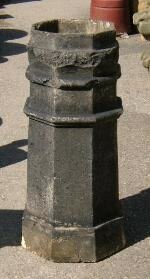 Damaged on one of the points of the crown. 720mm (28 1/4 ") high. A vented and jet chimney pot. Some damaged to jets. 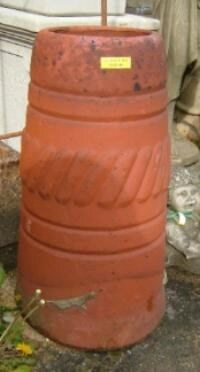 A small light terracotta chimney pot. Damaged at the bottom. 630mm (24 3/4 ") high. 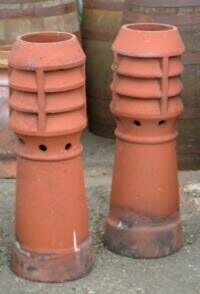 A pair of red louvred chimney pots, with vented holes. 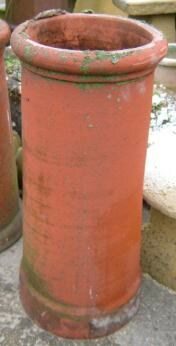 A tall red chimney pot, which has had the top cut off. 870mm (34 1/2 ") high. A small round buff chimney pot. 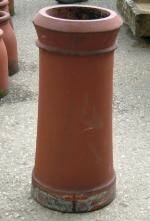 A tall red chimney pot. 300mm (11 3/4 ") diameter. 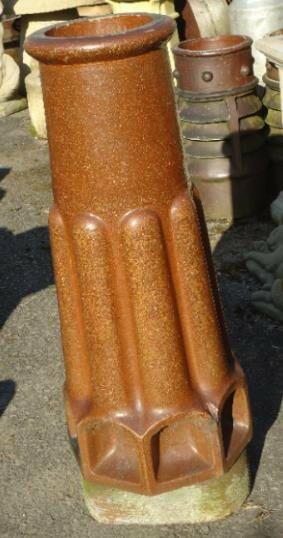 A painted brown , crown chimney pot. 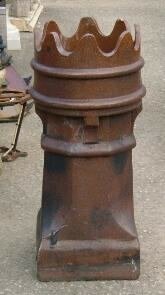 A brown glazed "Long Tom" chimney pot with indented pattern to top. 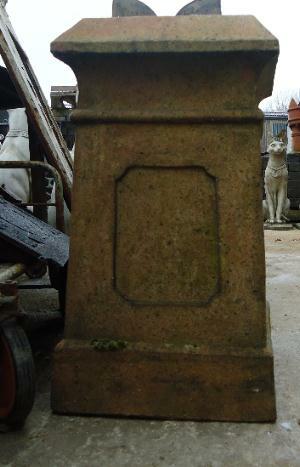 A small square buff chimney pot with pointed corners, one is damaged. 730mm (28 3/4 ") high. A red chimney pot with louvres to the top and "jets". 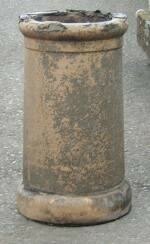 A brown glazed "Long Tom" chimney pot with indented pattern. 1380mm (54 1/4 ") high. 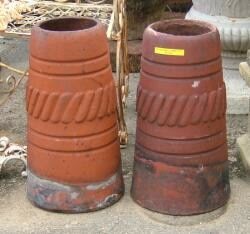 A pair of brown glazed louver chimney pots. 670mm (26 1/4 ") high. 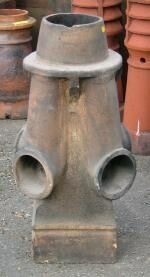 An unusual shaped brown glazed chimney pot, with jet inlets. 750mm (29 1/2 ") high. 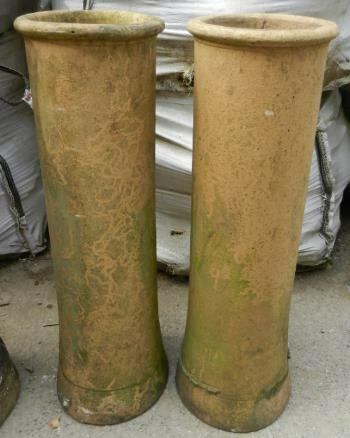 A pair of buff coloured crown chimney pots. Two tapered chimney pots with a raise pattern. They are almost a matching pair, but have a slight difference in colour. 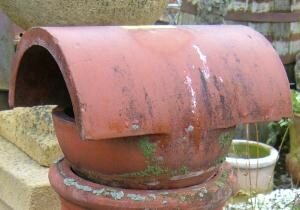 A glazed crown chimney pot, has damage to crown. A small buff plain chimney pot. 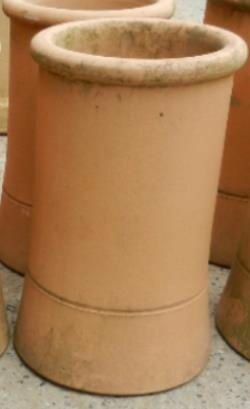 A small tapered plain brown chimney pot. 440mm (17 1/2 ") high. 320mm ( 12 1/2 ") square external size. A plain buff chimney with 4 points. 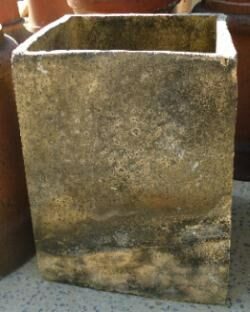 A small square shaped plain brown chimney pot. 350mm (13 3/4 ") high. 305mm ( 12") square external size. 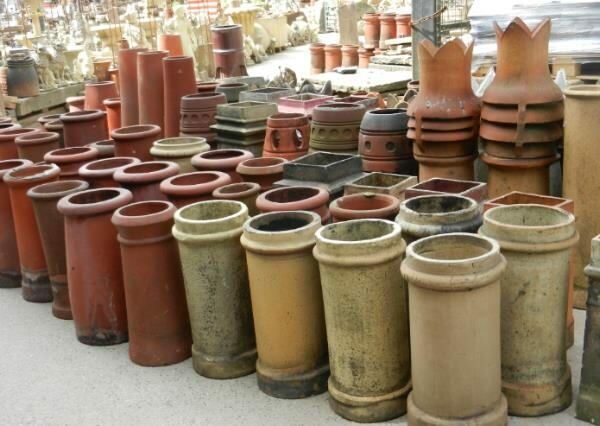 Description: A selection of small ringed red chimney pots. One has damaged on the rim. Base : 325mm (12 3/4 ") diameter . 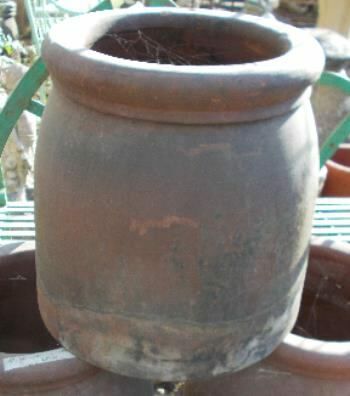 A terracotta coloured chimney pot with weather covered top. 270mm ( 10 1/2") square. 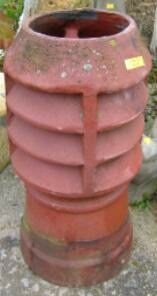 A small round red chimney pot. 290mm (11 1/2 ") diameter . A brown glazed, crown chimney pot. 770mm (30 1/4 ") high. 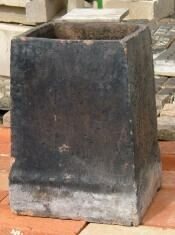 An old buff square chimney pot, with diamond mark on sides and smoked marked. 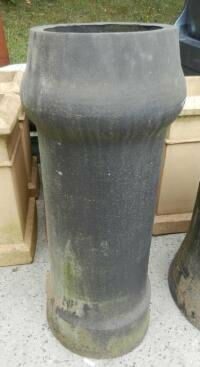 An old buff octagon shaped chimney pot that is black smoked marked with age. 305mm (12 ") diameter external size. 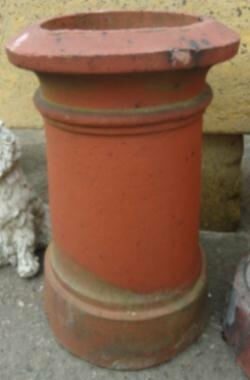 A red "H" shaped chimney pot. 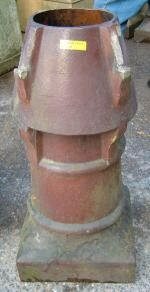 270mm (10 1/2" ") inlet diameter. 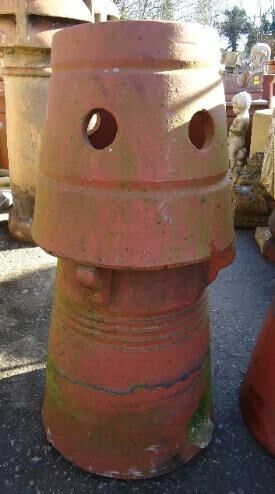 A painted chimney pot, with a spotty patterned indented top. 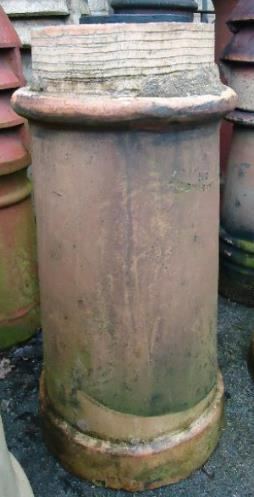 A red chimney pot, with a patterned indented top. 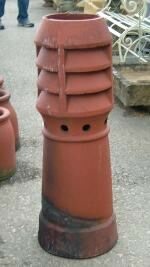 Description:.A very tall red chimney pot. Size: 1210mm (47 1/2 ") high. Base : 305mm ( 12"") diameter. Price : £135.00 each including VAT. 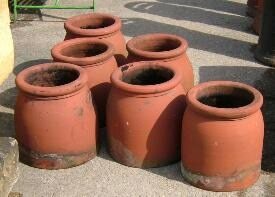 Description: A red chimney pot which is blackened by use. Base : 305mm (12") diameter. Description:.A red louver top, with air holes. (We have 4no. of these in at the moment). Base : 320mm ( 121/2"") diameter. 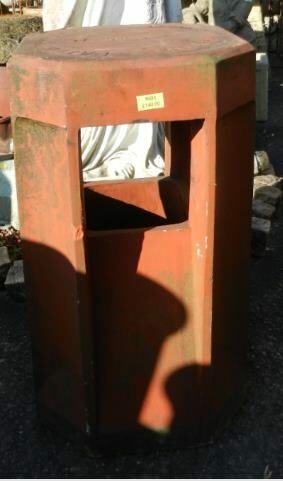 Price : £100.00 each including VAT. 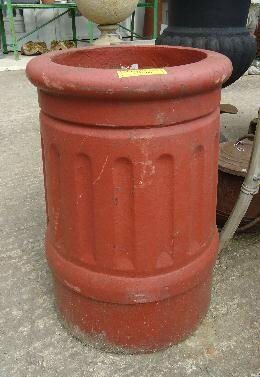 Description: A very tall red chimney pot. Base : 350mm (13 3/4") diameter. 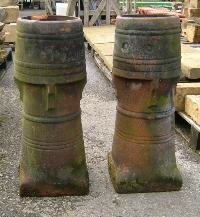 Description:.A pair of really nice tall buff, crown chimney pots. 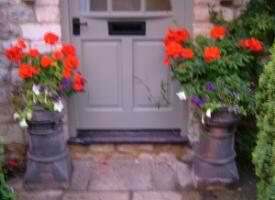 (Would look nice as planters, as well as for there traditional purpose). Base : 310mm ( 121/4"") square. Price : £130.00 each including VAT. Description: A collection of 3 no. 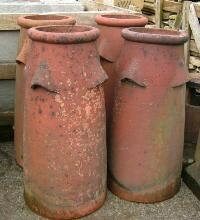 red round chimney pots. With rim on top and bottom. Base : 325mm (123/4") diameter. Description:. 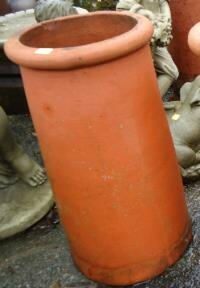 A small straight red chimney pot. (There are 8 no. of these in stock at the present time). Base : 340mm ( 131/2"") diameter. Price : £85.00 each including VAT. Description: A collection of 6 no. 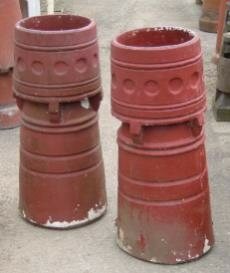 small red dumpy round chimney pots. Description:. 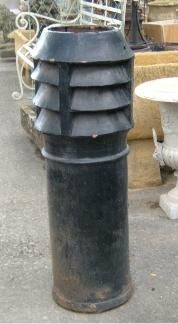 A tall black painted louver top chimney pot. Base : 330mm ( 13") diameter. Price : £105.00 including VAT. Base : 380mm (11") diameter. Description:. A red louver top chimney, with air holes. Base : 305mm (12 ") diameter. Price : SOLD including VAT. Description:. 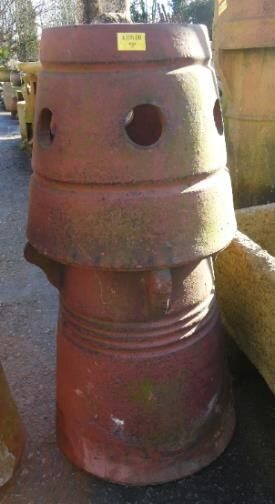 An unusual chimney pot with curved top. Base : mm ( ") diameter. Price : £ to follow including VAT. Base : 330mm (13") diameter. Description:. 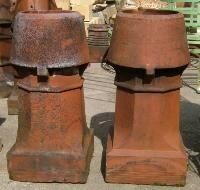 A pair of reclaimed red clay chimney pots, with indented spots. Price : £105.00 each including VAT. Base : 305m (12") diameter. Description:. 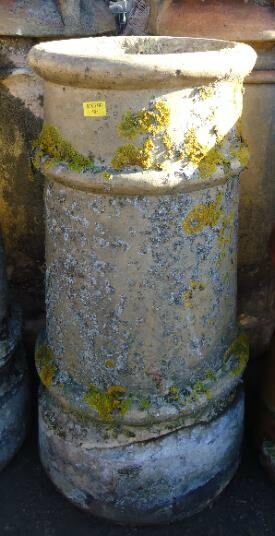 A buff coloured, reclaimed chimney pot, which has in the past been painted green, but is wearing off. Has damage to one piece of the crown. Base : 317mm (12 1/2 ") square. Base : 343mm (13 1/2 ") square. Description:. 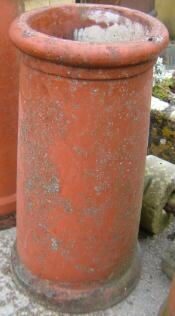 A red clay small, reclaimed chimney pot. Size: 350mm (13 3/4 ") high. Price : £55.00 including VAT. Description: A red glazed, round crown topper. Base : 342mm (13 1/2 ") diameter. Description:. 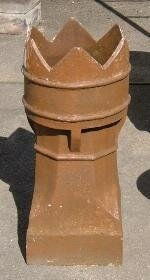 A buff colour, reclaimed chimney pot, with crowns to the top corners. Size: 743mm (29 1/4 ") high. Base : 305mm (12") square. Price : £95.00 including VAT. Description: A dark glazed, round crown topper. Base : 267mm (10 1/2 ") x 229mm (9"). 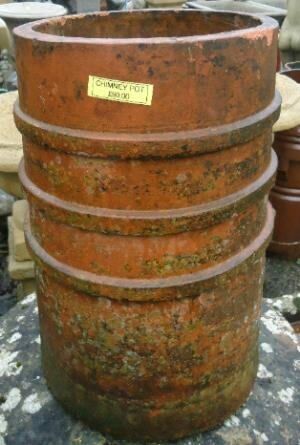 Description: A red coloured, neat looking reclaimed chimney pot. Description:. 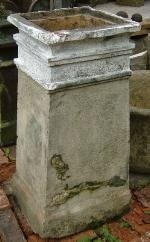 A light coloured, crown corner top, reclaimed chimney pot. Base : 310mm (12 1/4 ") x 280mm (11"). 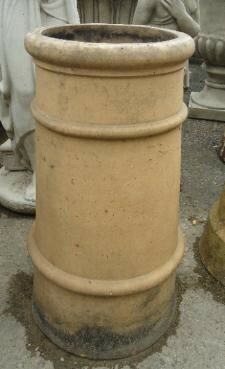 Description: A light coloured reclaimed chimney pot, with a square rimmed just below top. Description:. 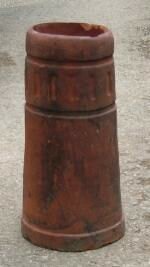 A plain tall, reclaimed chimney pot. Base : 350mm (13 3/4 ") diameter. Price : £75.00 including VAT. 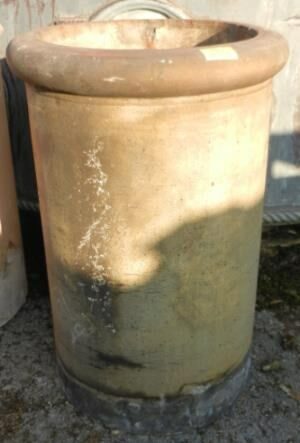 Description: A light coloured reclaimed chimney pot, the top was painted in the past, but is starting to wear off. Base : 355mm (14") x 305mm (12"). Description:. A red clay, with louvred top, reclaimed chimney pot. Base : 330mm (13") square. Description:. 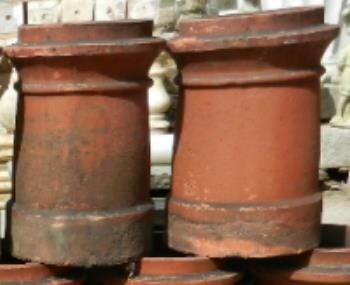 A small crown red clay, reclaimed chimney pot. Base : 254mm (10") diameter. Price : £ SOLD including VAT. 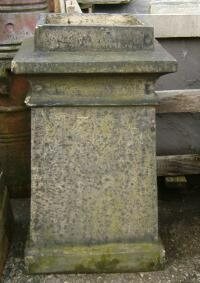 Description: A single light coloured, with raised diamond shape on sides and crowns on the corners, chimney pot . Base : 241mm (9 1/2 ") x 229mm (9") . Description:. 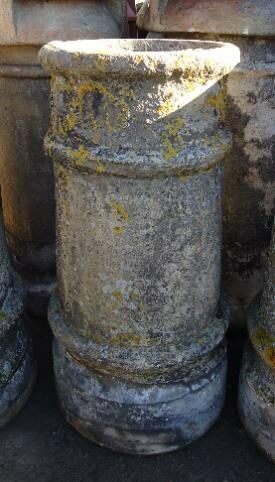 A crown topped reclaimed chimney pot. Price : £100.00 including VAT. 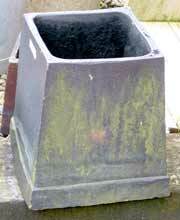 Description: A single, glazed square based, small sized chimney pot . Base : 318mm (12 1/2 ") square. Description:. 3 no. 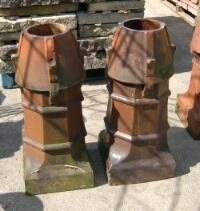 dark, small sized reclaimed chimney pots. Almost the same size (maybe an inch here or there), and slightly different colours. Base : 318mm (121/2") square. Price : £70.00 each including VAT. 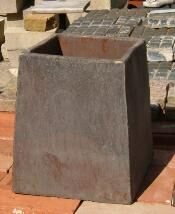 Description: A dark glazed square, medium sized chimney pot . Description:. 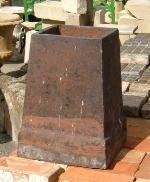 A dark, medium sized square shaped reclaimed chimney pot. 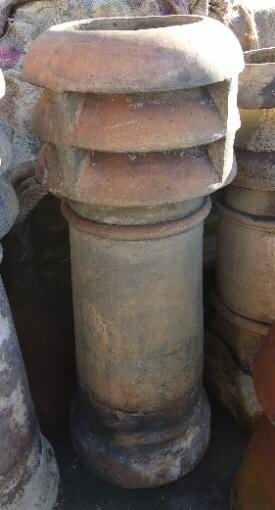 Description: A tall fluted crown, dark terracotta, reclaimed chimney pot. (Small chip on one point of crown). Description:. 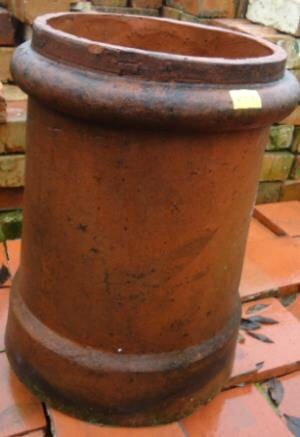 An unusual shaped reclaimed red clay chimney pot. Price : £145.00 including VAT. Description: 2 no. 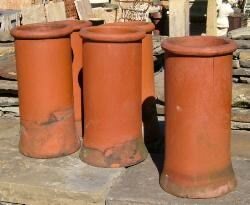 tall plain, dark terracotta, reclaimed chimney pots. Description:. 2 no. 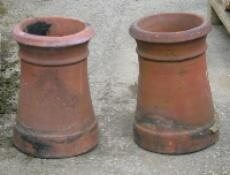 small pretty, reclaimed red clay chimney pots. Price : SOLD each including VAT. 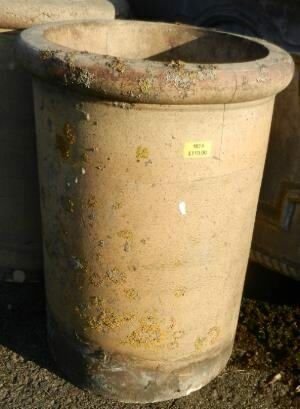 Description: A tall light terracotta, reclaimed chimney pot. Base : 305mm (12") x 254mm (10"). Description:. 2 no. 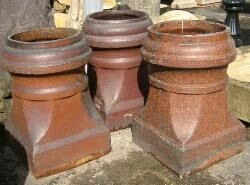 reclaimed red clay chimney pots. Description: 2 no. 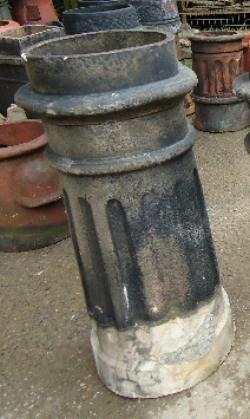 small buff coloured, reclaimed chimney pots. Description:. 2 no. 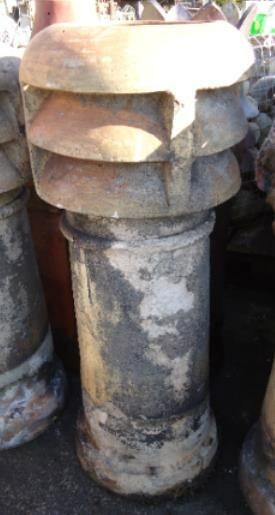 reclaimed red glazed chimney pots, with indented spot motifs. 762mm (30") high x 330mm (13 ") base diameter. Price : £95.00 each including VAT. Description: 2 no. 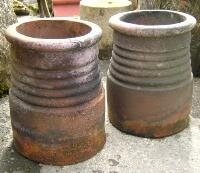 glazed clay, reclaimed chimney pots. Base : 343mm (131/2") sq. Description:. 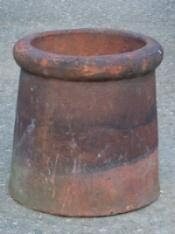 A small plain reclaimed red clay chimney pot. 375mm (14 3/4") high x 265mm (10 1/2 ") diameter. Price : £40.00 including VAT. 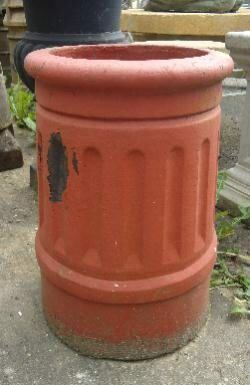 Description: A small, dumpy red clay, reclaimed chimney pot. Size: 310mm (12 1/4 ") high x 325mm (12 3/4 ") diameter. Description:. 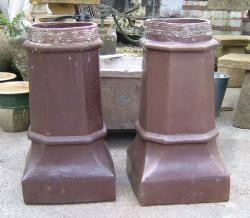 2 reclaimed red clay chimney pots, with square base and round top, with vent holes near the top. Size: 610mm (24") high x 280mm (11 1/2 ") diameter top x 305mm (12") square base. 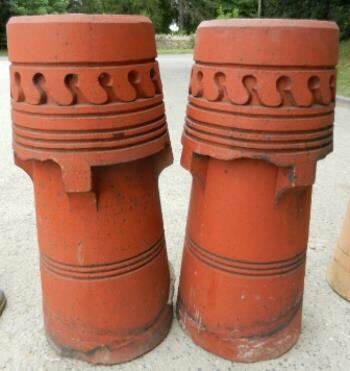 Description: 2 small, red clay reclaimed chimney pots, with ring pattern around top section. Size: 381mm (15 1/2 ") high x 305mm (12 ") diameter. Description:. 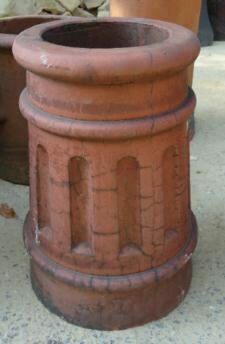 A reclaimed red clay coloured chimney pot with fluting pattern near the top. Size: 625mm (24 1/2") high x 290mm (11 1/2 ") diameter. 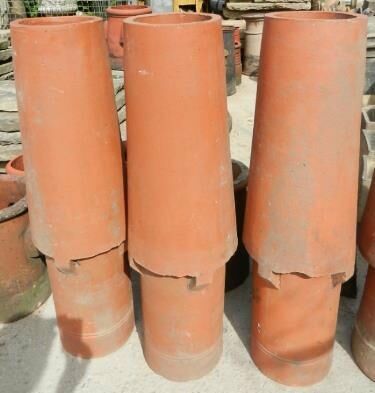 Description: 4 plain, red clay reclaimed chimney pots, with 4 vents around the top. Size: 670mm (26 1/2 ") high x 305mm (12 ") diameter. Description:. 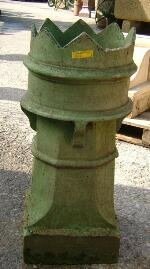 A reclaimed buff coloured chimney pot. 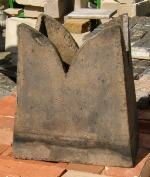 Size: 695mm (27 1/2") high x 380mm (15") wide x 320 12 1/2 deep. 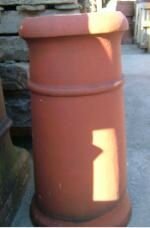 Description: A red reclaimed vented chimney pot. Size: 810mm (32 ") high x 345mm (13 1/2 ") diameter. Description:. 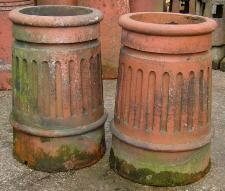 A reclaimed red clay chimney pot, with fluted sides. Size: 502mm (19 3/4 ") high x 305mm (12") diameter of base. Description:. 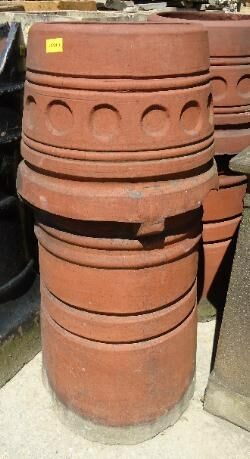 A reclaimed red clay chimney pot, with unusual pattern. Size: 583mm (23 ") high x 330mm (13") diameter of base. Price : £120.00 including VAT. Description: 2 no. square reclaimed, chimney pots. Size: 700mm (27 1/2 ") high x 340mm (13 1/2 ") square . Description:. 2 no. 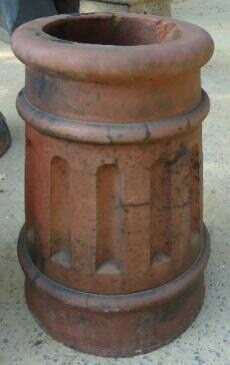 reclaimed fluted red clay chimney pot. Size: 495mm (19 1/2 ") high x 330mm (13 ") diameter. Description:. 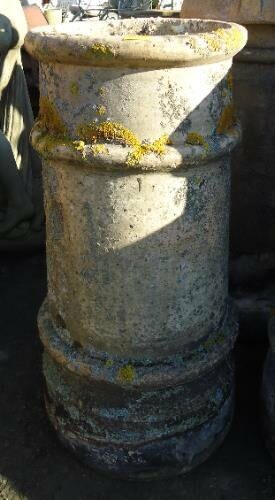 A reclaimed small crown chimney pot. 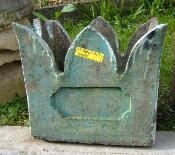 Size: 440mm (17 1/4 ") high x 340mm (13 1/4 ") x 260mm (10 1/4") base. Description:. 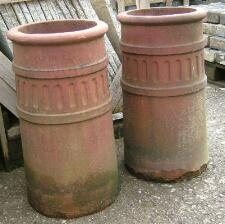 A pair of reclaimed red clay chimney pots, with fluting. Size: 600 mm(23 3/4 ") high x 320mm (12 1/2 ") diameter. 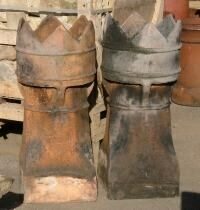 Description: Reclaimed chimney pots with crown tops. Size: 790mm (31") high x 320mm (12 1/2") diameter. Description:. 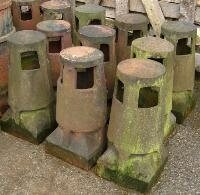 Reclaimed chimney pots, with holes around the top section. Size: 710mm(28") high x 320mm (12 1/2 ") diameter. Price : £90.00 each including VAT. 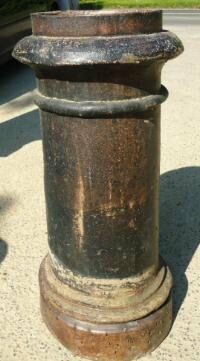 Description: A reclaimed chimney pot : glazed finish with louvres and a crown top : Octaganol in shape. Size:1040 mm (41 ") high × 305mm (12") square. Description:. 2 no. 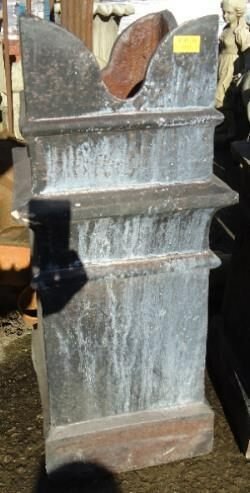 Reclaimed : Glazed finished small chimney pots. Size: 480mm (19") high x 305mm (12") square at base. 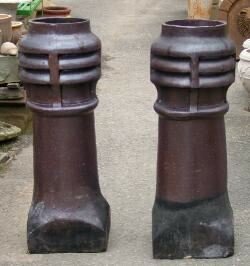 Description: A Tall Chimney pot with jelly mould shape to lower section. Size: mm ( ") × mm (") × mm (") Sizes will be put on shortly. 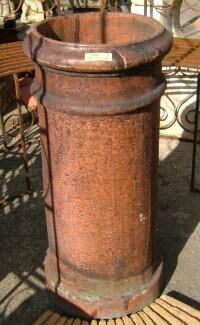 Description: Buff coloured Reclaimed Chimney Pot, probably Victorian. Octagonal shaped. 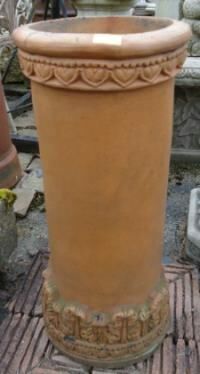 Description: A Buff coloured Chimney Pot with 3 openings. 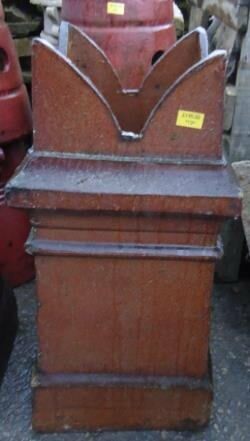 Description: A reclaimed buff coloured square based chimney pot with slit vents to all 4 sides. 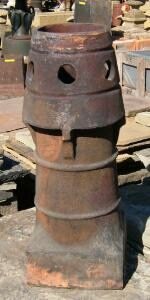 Description: A 19th century chimney pot with 4 openiungs and a cap. These could be used for discreet external lighting with some thought. We have several of these in stock at the present time. 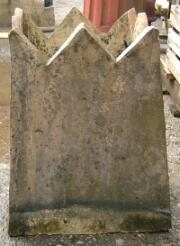 Size : 410mm (16 1/2") high x 203mm (8") square at base. 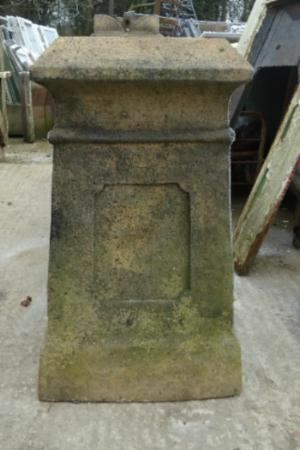 Description: A reclaimed square chimney pot. 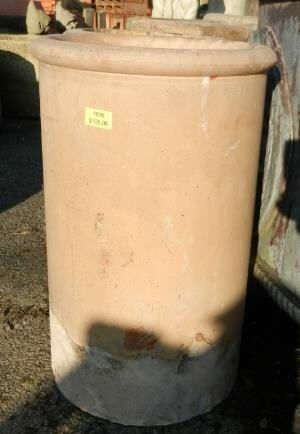 Description: A buff coloured reclaimed chimney pot with louvres. 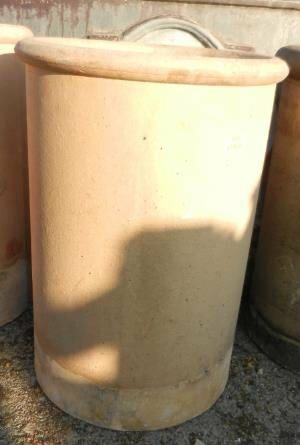 Description: A reclaimed brown chimney pot with louvres to the top section. 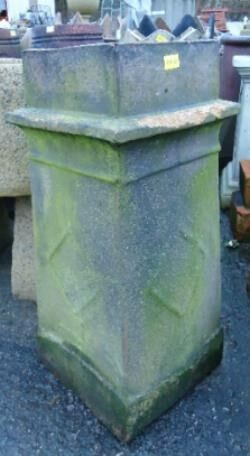 Description: A reclaimed octagonal buff coloured chimney pot. 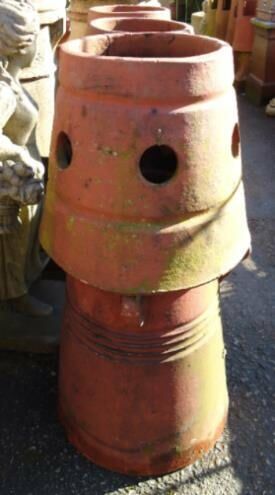 Marked with "Doulton & Co"
Description: A reclaimed, brown glazed chimney pot with a crown top and louvres to the mid section. 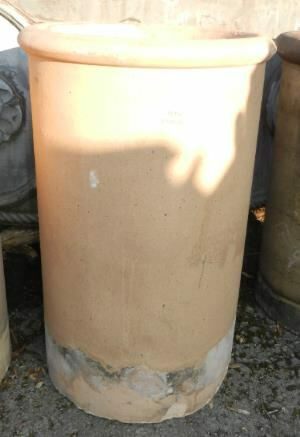 Description: Reclaimed Chimney pot with 4 air vents to the sides.